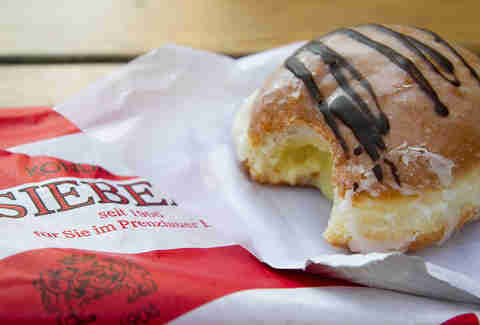 The very name "Berliner" means donut, so you can be pretty sure that Berliners themselves they take their sweet pastries seriously. 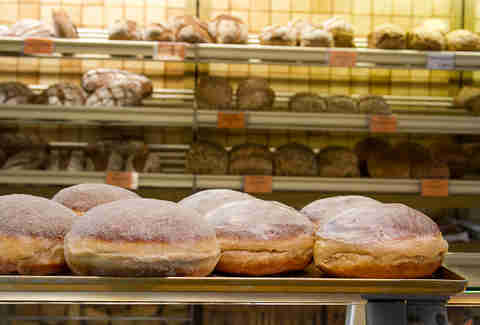 Since Germans are also kinda' traditionalists when it comes to food, the options are usually perfectly-baked, yet samey (w/ filling varieties generally limited to either cherry or plum marmalade), so we've thrown a little variety into the mix, and hunted down the five greatest donuts in Germany's capital. Entering this 100yr-old bakery is like stepping into a time machine (one that does better donuts than a DeLorean). Although it's just a few blocks from a busy street in Mitte, it’s on a quiet side street and run by ladies who clearly know their stuff. In a country known for its delicious pretzels, it's pleasing to know that you can have one that's deep fried, almost like funnel cake, and covered in a sweet glaze. 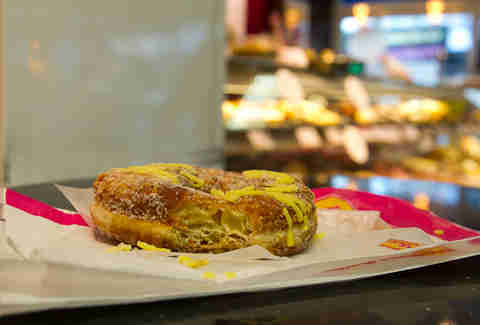 Ladies and gentleman, the Cronut has landed in Berlin. Sure, the Germans can’t get the name right and/or don't want to get sued, but the idea’s the same. Bakery chain Thürmann -- which you’ll find inside many REWE and Edeka supermarkets, among other locales -- is riding the US flag, offering their Curlyssant croissant-donut hybrid w/ apple, cherry, or crème filling. While there may not be actual Cronuts in Berlin, the local peeps form Dominique Ansel-esque lines down the block for this tiny bakery, one of Prenzlauer Berg’s oldest. 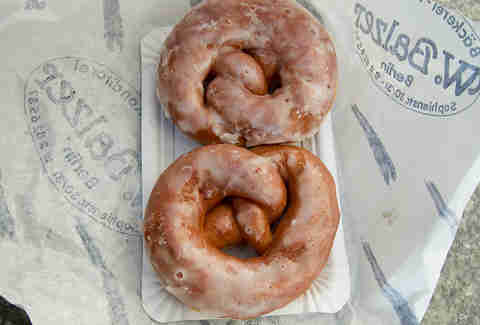 It’s for good reason: Siebert opened in 1906 and has been winning awards for its pastries, including the coveted “Golden Pretzel” (! ), ever since. They do the traditional plum pfannkuchen, as well as giant cream-packed éclairs, but you need to opt for the Eierlikör, not only for the rich chocolate icing on top, but also for the delicious filling; a custard sauce spiked with brandy. This family-owned bakery’s been around since 1898 and they run a tight ship -- the strict shop keepers will evil eye you for wasting time, so go in prepared. Luckily, we’re telling you what to get: the chocolate pfannkuchen. 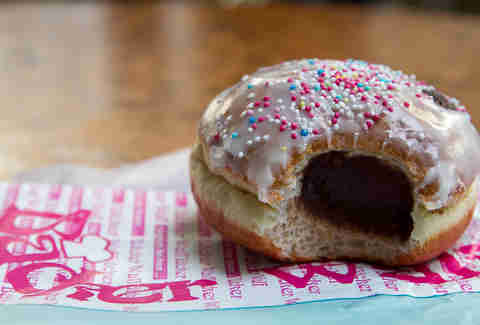 The fluffy pastry is filled w/ rich, pudding-like filling, a nice break from jelly donuts, plus we’ve got a thing for sprinkles, which are criminally uncommon this side of the Atlantic. If you’re gonna go traditional pfannkuchen, you might as well go giant. This Kreuzeberg bakery -- family run since the 1970s -- turns out these larger-than-life 'nuts daily, clocking in at 500 grams each. 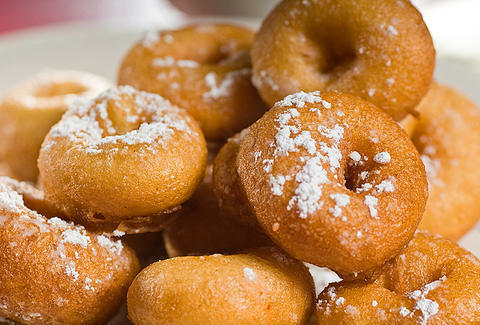 Try the cherry-filled glazed version or the sugar-dusted plum marmalade, or totally carb-load & down them both. That's right. We said it. Come get us. 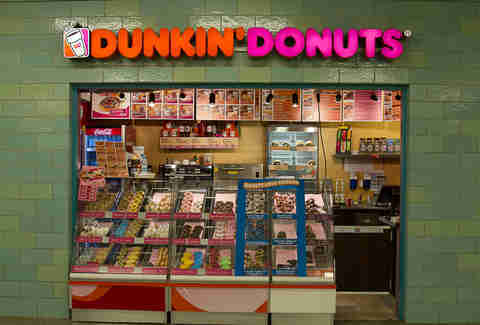 One of the best donut places in Berlin is Dunkin'. To avoid being caught going there to sample their deliciously American wares, however, we suggest heading to the totally incognito second level of the Alexanderplatz train station. Although the Bavarian crème would be fitting for a German sweet splurge, the Banana Cherry has to be our pick, just for the sheer in-your-face, German-tradition-defying oddity of it.